Silly, silly fun. There’s not much of a plot — The Croods are a family of cave-dwellers whose home is threatened by earthquakes; the dad Grug (Nicolas Cage) is over protective; the daughter Eep (Emma Stone) is curious; they meet up with a smarty-pants guy named Guy (Ryan Reynolds) who teaches them the secret of fire, among other things; and they set off to find a new home. 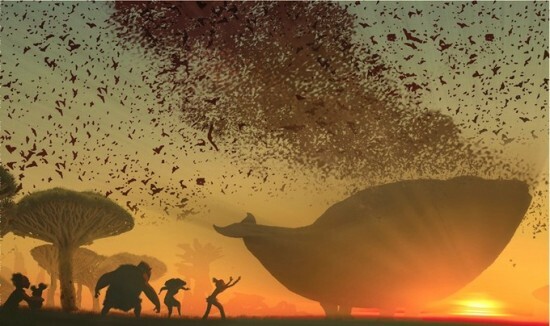 Grug, whose mantra is “Always be afraid!” immediately dislikes Guy while Eep is immediately attracted to him, and in the background are the rest of the Croods, who have their moments but are played for jokes; maybe they could have been something more, but before they can, the earthquake chases them off. There’s two running gags that persist the entire film, and there’s some ugly character design, but those are the biggest flaws. And they’re easy to overlook because everything else looks so good. Granted, this doesn’t need to be in 3-D, as the lusciousness of the backgrounds, from crags to forests to plains to dried-out oceans encircle and captivate on their own, without added gimmicks. More fun is the creature designs, which must have had even the animators laughing. Each one is a Darwinian nightmare, conjured by a gaggle of mad scientists. There’s flying turtles, land-whales, two lemurs attached by a single tail and a flock of birds that look like toucans, though their mouths open right below the eyes. Cute at first, then they swarm on one of the land-whales and pick it clean. Despite that, the emphasis is clearly on the visuals, as are the gags. The talents of Cage, Stone, and Reynolds, as well as Cloris Leachman and Catherine Keener, aren’t necessary. None stand out, but then there’s little the film requires of them. Of course we have the requisite familial tensions and affirmations of love between those who need to hear it — they aren’t earned and slow the movie down considerably whenever they’re brought up, but they’re not often and don’t last long. Curious dangers are a trope of animated films, but The Croods, aside from forgoing the standard mishmash of pop-culture references scriptwise, is frequently more innovative. When the group is hunting a sharp-toothed bird, for example, they use a makeshift trap to kill it, but the deed itself is cleverly sidestepped by cutting from an explosion of feathers to a fully-cooked meal. It’s played as its own joke upon censors, and works because it doesn’t call attention to itself — just a quick cut, and then on to the next. And that’s the tone of the film: swift and unpretentious. From the impressive opening hunt sequence, it’s hard to believe that the film can keep up such a pace. Yet, somehow it does, throwing a lot at the screen, and most of it is great. In all, The Croods is short on performances but long on creativity, which is probably as it should be. The theme of adaptation, fear, and technophobia is sprinkled over the story, but it’s not dwelt upon for any serious length of time. And despite the odd angles that emphasize Eep’s curves and shot after shot of ever-so-slight upskirts, this is sternly built for kids, but the film’s greatest charm is that it makes the adults feel like kids, too.